And "Absolutely-Any-Reason-You-Can-Think-Of-To-Get-Together Party" with your friends / co-workers / neighbors!! You get the room 15 minutes before and after your party to celebrate. The Main Studio can accommodate maximum of (50) guests. The Private Party Studio can accommodate maximum of (34) guests. The minimum number of painters required for private parties ANYTIME is (10). Once the private party has been booked, the host/hostess will receive an email with passcode giving you access to our gallery of over 6000 paintings to choose from. Hosts can also email or print custom invitations. Guests can then go online and individually pay and register for the private party, or the host/hostess may instead pay with one payment for the party. Please Note: Gift Certificates and Frequent Paint cards will not be accepted for a PRIVATE PARTY. How do I book an Adult Private Party? Check Your Party Size: Make sure your party meets the minimum requirements to reserve a private party room (see above). If you aren't sure you can meet the minimum, we welcome your group to join any open class on our public calendar. Chose a Date and Time: Private parties may be scheduled at any time and any day of the week, as long as a room and artist are available. If no one has signed up yet for a scheduled public class, then we may be able to book it for your private party instead. To see if your date is available, call us at 469-316-1940 or request a party online. 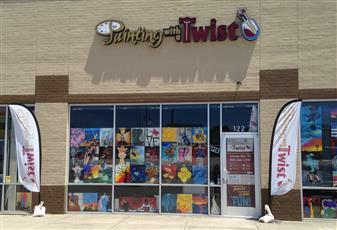 Pay the Down payment: Our regular prices are $35 per person for 2-hour paintings and $45 for 3-hour paintings. There are no additional charges for in-studio parties. For all Private Party times: A non-refundable down payment of 6 seats minimum is required to hold your reservation. If your party has not received the minimum number of reservations (10 seats) at least 7 days prior to your scheduled party, then your private party will be opened up to public reservations. Select a Painting: After we receive your down payment, we will send you a link to our online library to make a painting selection. Invite Guests: Please have your guests arrive at least 15 minutes before your scheduled class time to set up, pour drinks, and socialize. Sign up your small group in a regular scheduled class. Let us know and we will seat your group together. No contracts, no hassles. VIP Party: Group of at least 6. Pick your painting. Pick your night. We will open registration to the public and setup a VIP section for your group. This is first come, first serve. Since you are picking the painting and the night, we do require all reservations are paid at time of your VIP booking. VIP Request do not apply to Friday/Saturday after 7:00pm. This option requires a 2 week advanced notice. Can I book a Private Kids Party? Yes! Times: Kids parties can be booked for any day of the week. All kid parties must be completed before 5:00pm. Parties will be allowed a 2 hour time slot. Minimums: You only need 10 kids. The kids create a party favor unlike any they have ever had before. Our instructors will guide the kids through a painting for about one hour; the other hour is devoted to the goodies and the presents. The mess stays with us and the kids love being here. The 10 child minimum will not be optional, we will bill for a minimum of 10 seats. Cost: The cost is only 35$ per child. You provide the kids, we provide the fun! 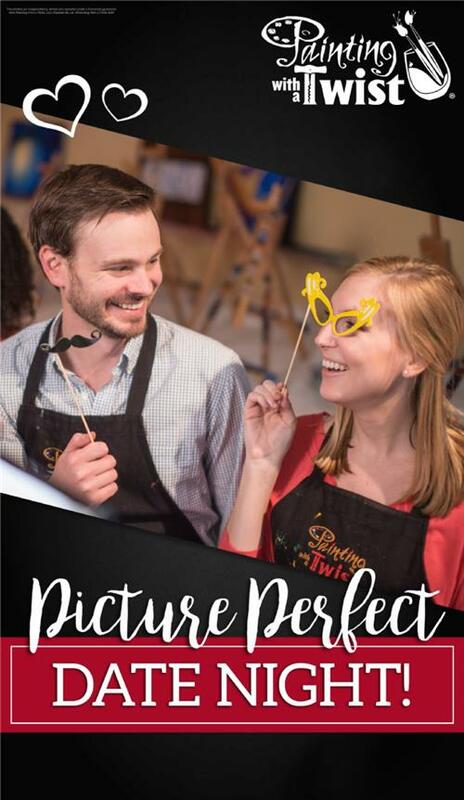 Join us for a unique and fun filled party they will never forget. Please note that our children’s art classes are a 1 ½ hour painting, but may be modified to accommodate your painting class and celebration; so that you are finished in your 2 hour time frame. We will keep the theme of the art piece the same but modify the piece so we can complete the piece and then move on to the cake and goodies. Down payment: A NON-Refundable down payment of 6 seats minimum is required to hold your reservation. If your party has not received the minimum number of reservations at least 7 days prior to your scheduled party, then your private party will be cancelled, unless you pay the rest of the minimum of seats up to 10. The minimum suggested age for a child painter is 8. Do you do OFFSITE painting parties? Absolutely! We can bring the party to you! Painting prices are the same, although a travel and setup fees apply. Minimum attendee requirements apply. Payment in full required prior to event.Please email or call for complete information on Off-Site Parties. Individuals: Individual credit/debit card refunds may be given with at least 48 hours advance notice, but will be assessed a 15% processing fee. We do not refund cash. Individuals canceling with at least 24 hours notice will be given a refund for the full amount in STUDIO COMP ONLY with an expiration date of 60 days. We require 24 hours notice of cancellation so that we may offer your spot to another customer, any cancellations with less than 24 hours will not receive a refund or store credit. (We require an email request for any Cancellations or Reschedule request, Please reply to your initial confirmation with your requests. Phone calls are appreciated but do not serve as your cancellation.) No shows will not receive a store credit. For any other reasons not specified, we do not give credit card or cash refunds; any and all other refunds given will be in the form of a COMP gift certificate with a 60 day expiration or a class transfer. Gift certificates can be transferred to another person with an email request. Private Parties: If you should need to cancel a private party, we require notification 10 days prior to the event or forfeit your entire down payment or total amount paid, whichever is larger. All cancellation refunds will be given in the form of a Party Move Date for your entire party or a Studio COMP Gift Certificate that has a 60 day expiration. We do not refund cash or credit for Private Parties.